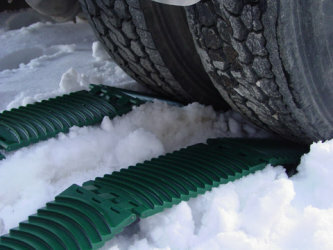 Go Treads is a simple, unique, auto tool designed to provide the traction needed to get vehicles going again when stuck in snow, mud, or sand. Go Treads are light and easy to use. It can be put in position in a matter of seconds with no tools and no assembly required. The deep grooves grip the slippery surface and the tire to provide the necessary traction to get the vehicle moving again, safely, without damaging the tire. Works on small cars, heavy trucks, even semi trucks. The patented arched grooves help the tool stay centered under the tire while adding strength to the tool as it supports the weight of fully loaded trucks. Get your truck or car unstuck with Go Treads! Great gift for truck drivers, auto buffs and commuters! Made by Wichita area company Pinto Inc. Go Treads is based in Buhler, KS and ships nation-wide.